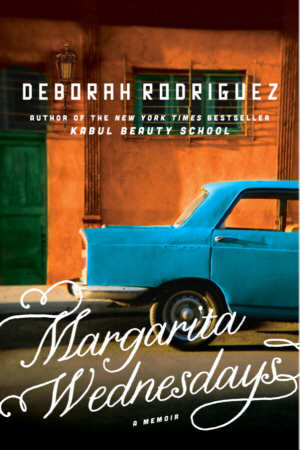 In answer to the question of what happened following her New York Times bestseller Kabul Beauty School, Deborah Rodriquez is back with a new memoir, Margarita Wednesdays: Making a New Life by the Mexican Sea. Irreverent, insightful, and blatantly honest, Deborah takes us along on her inspiring journey of self-discovery and renewal after she is forced to flee Afghanistan in 2007. She first lands in California, where she feels like a misfit teetering on the brink of sanity. Where was that fearless redhead who stared danger in the face back in Kabul? After being advised to commune with glowworms and sit in contemplation for one year, Rodriguez finally packs her life and her cat into her Mini Cooper and moves to a seaside town in Mexico. Despite having no plan, no friends, and no Spanish, a determined Rodriguez soon finds herself swept up in a world where the music never stops and a new life can begin. Her adventures and misadventures among the expats and locals help lead the way to new love, new family, and a new sense of herself. In the magic of Mexico, she finds the hairdresser within, and builds the life she never knew was possible – a life on her own terms.